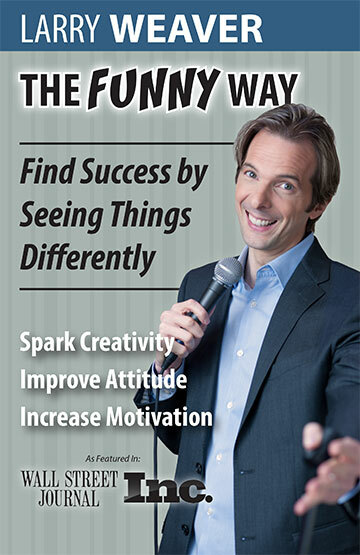 Positive lessons on Creativity, Attitude, and Motivation delivered with good, clean humor. 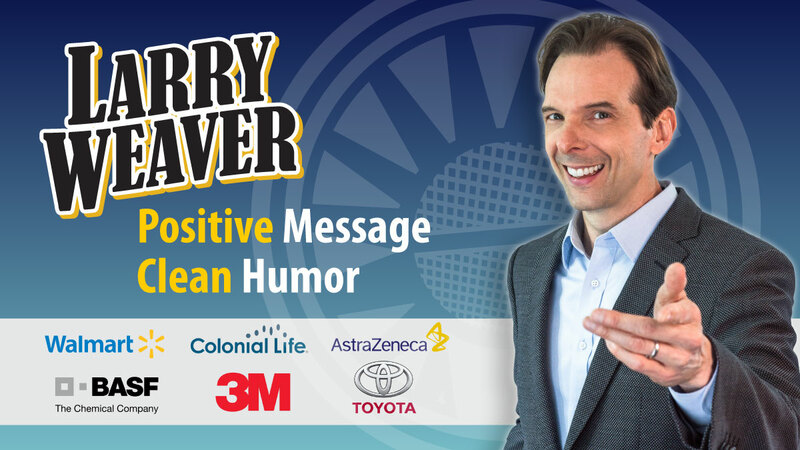 Professional comedian and business leader Larry Weaver uses clean humor, funny anecdotes, and emotionally charged stories to illustrate the importance of creativity, attitude, and motivation. These topics are crucial to success in any venture, whether your focus is leadership, teamwork, customer service, sales, change, or just reducing stress. Creativity: understand the issues, brainstorm effectively, and overcome obstacles. Attitude: tune out distractions, embrace change, and reduce stress. Motivation: find energy, practice excellence, and achieve your goals. 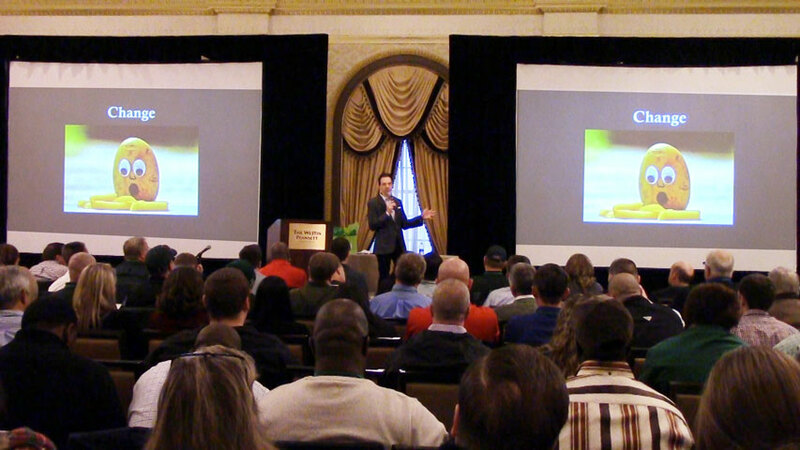 The presentation combines stand-up comedy with content – seamlessly intertwined. Your audience will laugh, learn, and leave feeling refreshed. Verifiable Reviews. A speaker you can trust. "Larry Weaver was great! Courteous, professional and eager to learn about our company and how he could design his performance with relatable material. 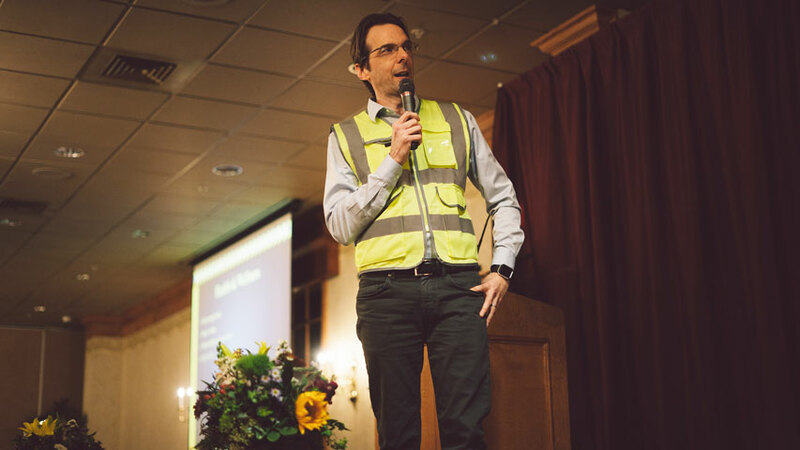 Great use of prop (safety vest) and presentation slides to highlight the safety theme. His jokes were clean, witty, and caught the essence of everyday challenges! 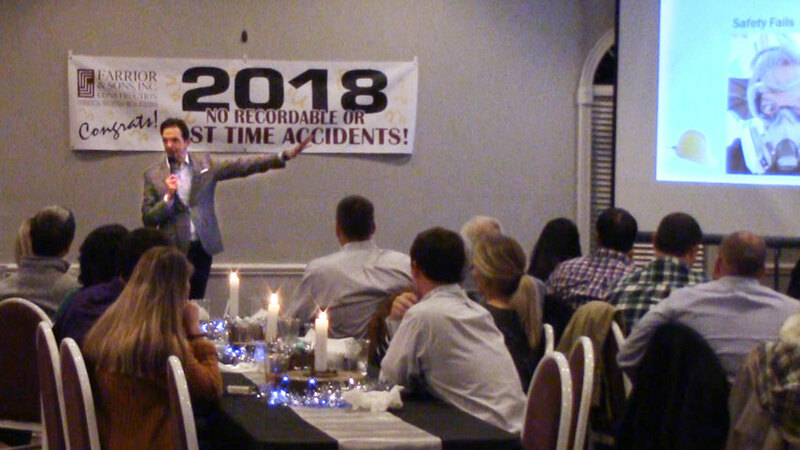 About 150 total attendees and all had a great time enjoying the comedy style of Larry! Highly recommend for a clean bout of jokes that also play on company standards (if you wish)!!" 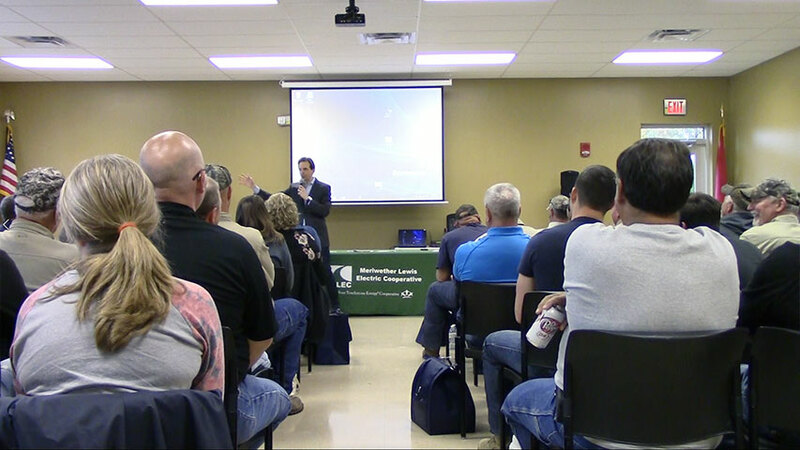 "Larry Weaver captivated our audience with humor related to our field of interest (safety and construction) but emphasized the importance of having a clean and safe work place at the same time. He showed interest in the audience by wanting to learn more about our company and the people, and used that information to appeal to the audience even more. 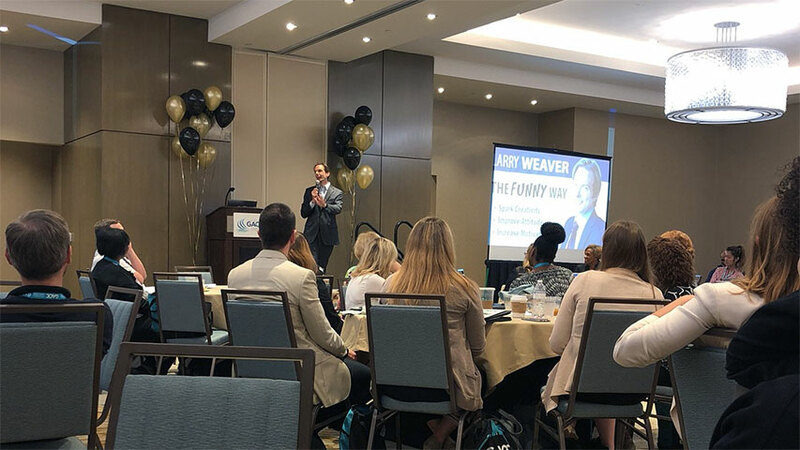 His Southern charm and sense of humor related to our audience and provided a much needed laugh as we celebrated 15 years accident free, which is unheard of in our industry. He demonstrated professionalism through his courteous demeanor and respect for our audience with good, wholesome comedy. His performance was definitely a game changer when it comes to the guest speakers we look for in our awards ceremonies! 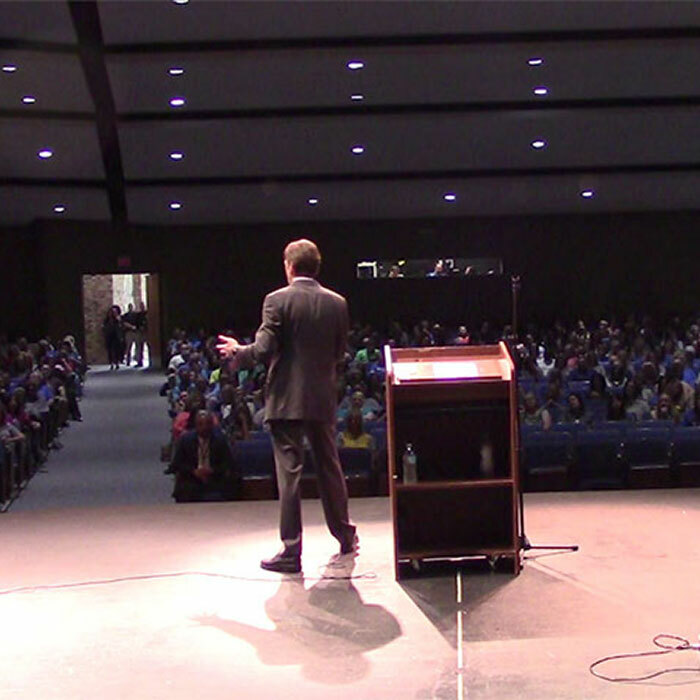 Our audience really enjoyed his personality, and he was a pleasure to work with." 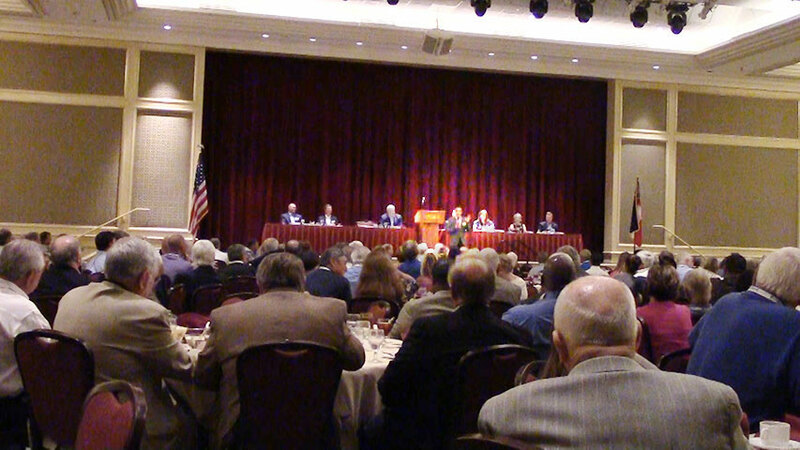 "We booked Larry Weaver for our Annual Meeting, which includes wide range of age groups and personalities. 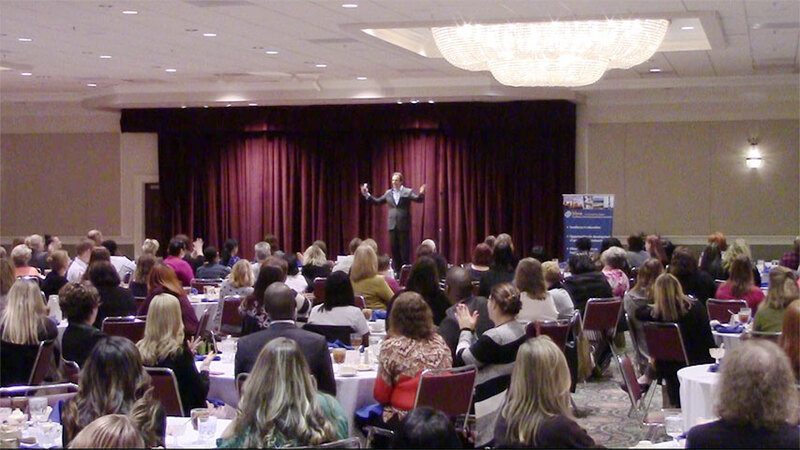 Each of our 250+ guests enjoyed his clean comedy and motivational message. 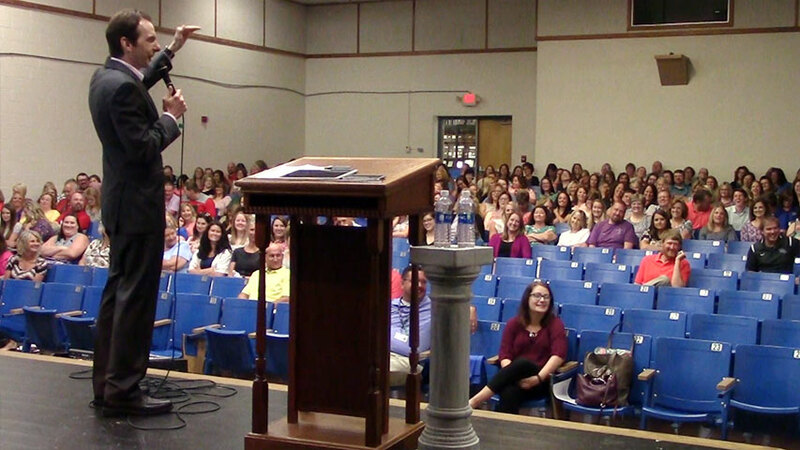 It's extremely hard to please that many people, but Larry was able to get everyone laughing and lighten the mood!" "Larry Weaver had a great connection with the audience and tied our Superhero Theme to his performance. His comedy was clean and we could all relate to his jokes." 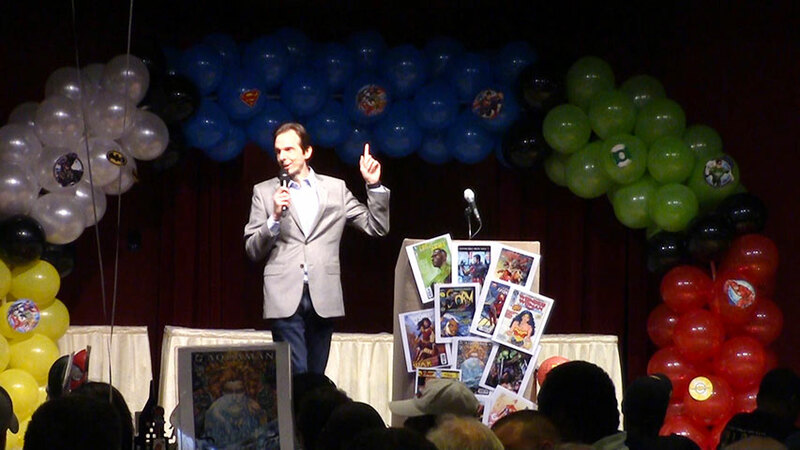 "Larry Weaver provided the perfect ending to our annual sales meeting! From initial contact to his actual performance, he could not have been easier to work with. Prompt, professional and very funny! Larry's humor was well received by our team and he was able to blend in a meaningful message that resonated with our group. The feedback has been outstanding! I would highly recommend Larry to any group or organization seeking good, clean entertainment. Top notch all the way!" "I am thrilled with Larry Weaver. Got nothing but good comments on his show and message. You never know what you are getting with live talent and Larry far exceeded our expectations. I have already recommended him to my colleagues." "Larry Weaver was awesome!!! I am so glad he spoke at our event. All the employees have raved about this routine. Even with some technical difficulties we had with the microphone, he didn't skip a beat - he was able to make light of the situation and keep the laughs coming! Our employees range in age from 20 to 60+ and everyone was laughing. He was very, very funny! It was a great way to end our event!" 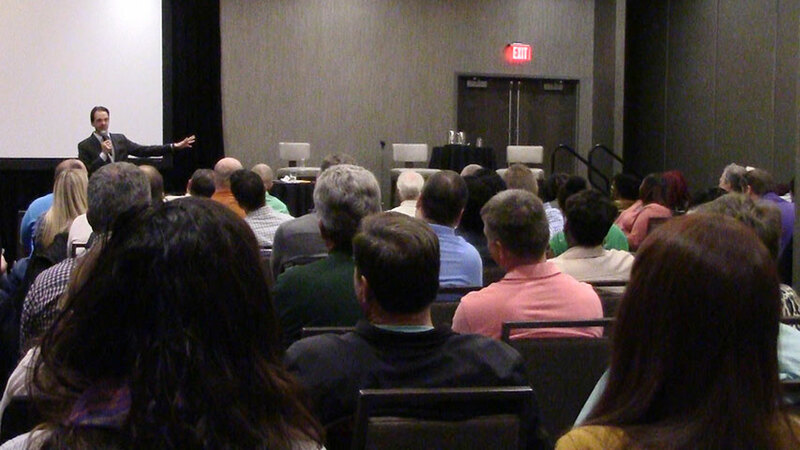 "We really enjoyed Larry Weaver's presentation at our all employee meeting. The jokes were a hit and, being from the south ourselves, were spot on! The motivational tips he threw in were just what we were looking for. I appreciate his promptness, professionalism, ease to work with and creativity. Larry's ability to tie in bits from our other training earlier in the day made it that much funnier! It was just what we needed after a long day of training!" "Larry Weaver was outstanding, beyond expectations. His humor and message left us energized and with something to truly think about and apply. I highly recommend Larry." 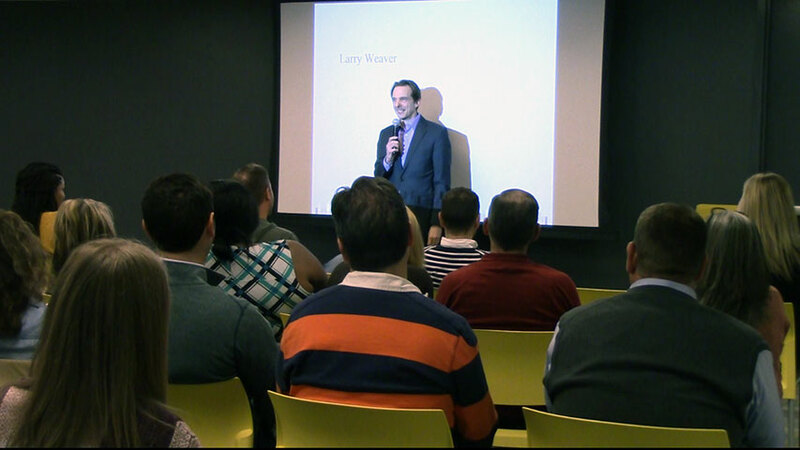 Larry is the President of Trusted Speakers, author of "101 Funny Employee Awards", and a recognized expert in Online Marketing. His business insights have been quoted in Inc. Magazine and The Wall Street Journal. A true veteran of the stage, Larry has delivered thousands of keynotes at corporate events, conventions, annual meetings, and conferences across the United States. He has the experience to make your next event a success!